This is the only guide you will ever need when looking for things to do with kids in Singapore. 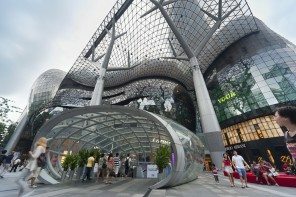 Originally published in 2015, this list of things to do with kids in Singapore is updated regularly so bookmark it and refer back often. We’ve got you covered for rainy days, hazy days, little kids and big, we’ve even got places mum and dad will love going just as much as the kids. Here’s the ultimate guide on things to do with kids in Singapore. 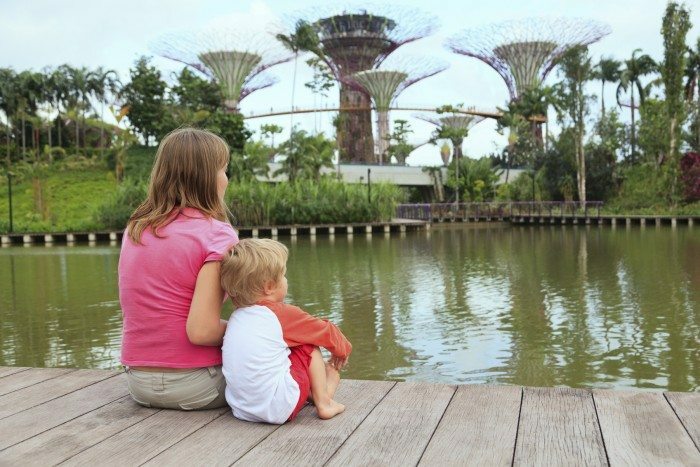 There are so many free and cheap things to do with kids in Singapore, that gardens and outdoor playgrounds are a great place to start. I find even playground hopping between HDB playgrounds keeps things interesting for the kids. 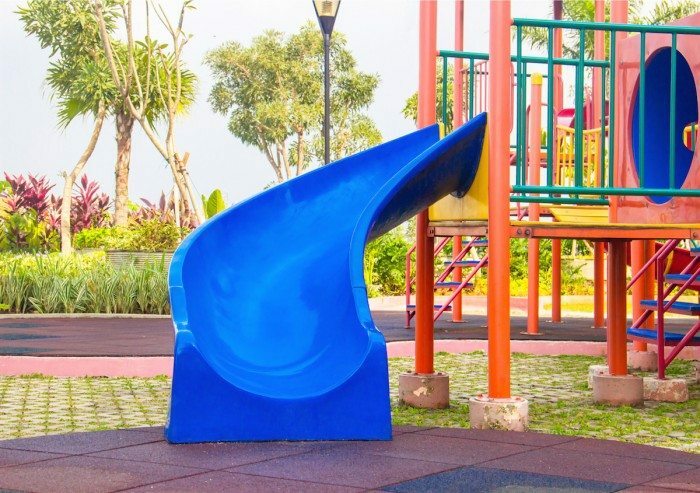 When it comes to Singapore’s best playgrounds, here are our favourites. Marine Cove at East Coast Park has a playground so big, you child’s mouth literally drop. After the initial shock, they’ll be good for many hours running around and trying the different obstacles and games. Not only is this outdoor playground huge, it also has areas for kids of all ages including a fenced in toddler area and challenging obstacles for the older kids to discover. Best of all, nearby dining options are well priced ranging from fast food to a café to local fare. A garden dedicated to kids. Children can play in a sand pit, explore a hedge maze, climb a tree house and walk along a swinging suspension bridge. Admission is free. 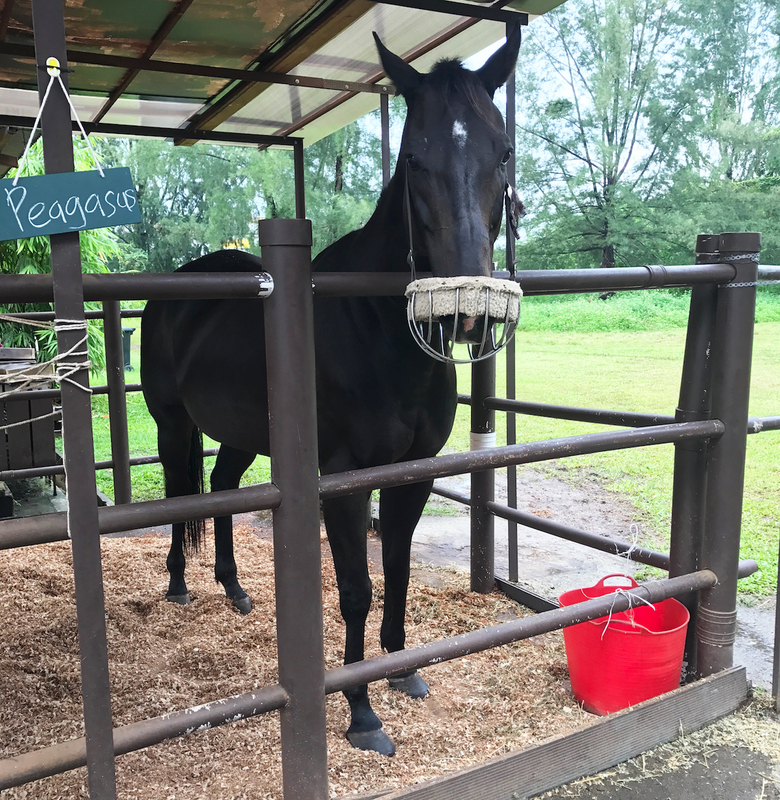 Head to Gallop in Punggol to get up close to horses and rabbits. Entry is free, you only need to pay for food if you want to feed the animals. Kids over 3 can enjoy pony rides in the morning and afternoons of select days for only $10. Once here, kids can also enjoy indoor crafts, outdoor games, and an indoor playground for an additional fee as well as on site dining options. 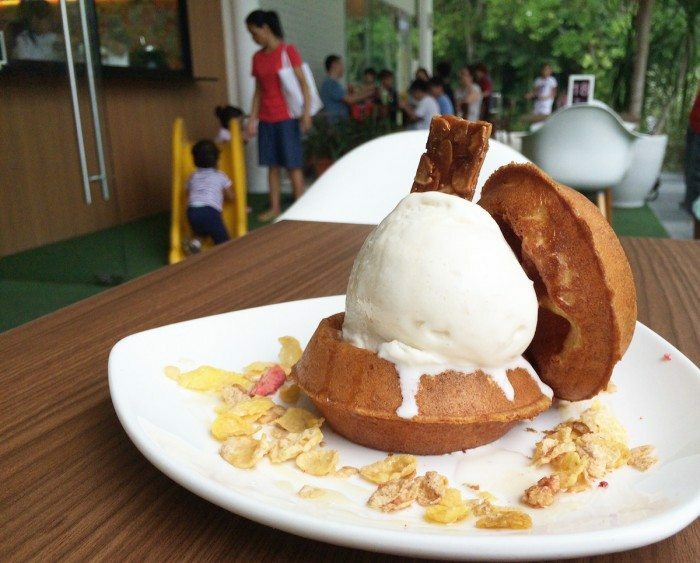 Tip: Gallop in Punggol is right behind Punggol settlement with more dining options as well as 2 outdoor playgrounds. Catering to kids from 1 to 12 years old, the one-hectare Far East Organization Children’s Garden consists of a 7.5 metre-tall tree house, playgrounds for kids of different ages and a water park and to splashing around in. Admission is free. Singapore’s Pasir Ris Park is a hidden gem that many people don’t know about or make the trek to visit. Similar to East Coast Park with a beach and playground but without the crowds. The outdoor playground is huge and will entertain the kids for hours. There’s sand play, swings, 2 flying fox rides, a suspension bridge, ride on equipment for toddlers and challenging obstacles for the older kids. 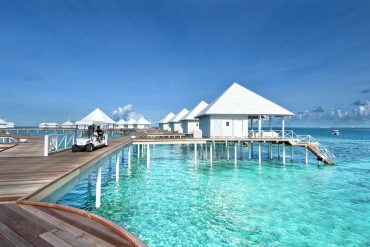 You can also rent bikes and ride along the water or try out different water sports at George’s. The area has a few different beach front dining options too. A fun way to spend an afternoon either flying kites or watching kites fly through the sky. Sit on the grass area atop the Marina Barrage building. For some water play, head downstairs to the water area for a splashing good time. For the little kids in your family that LOVE construction vehicles, this will be a dream come true for them. 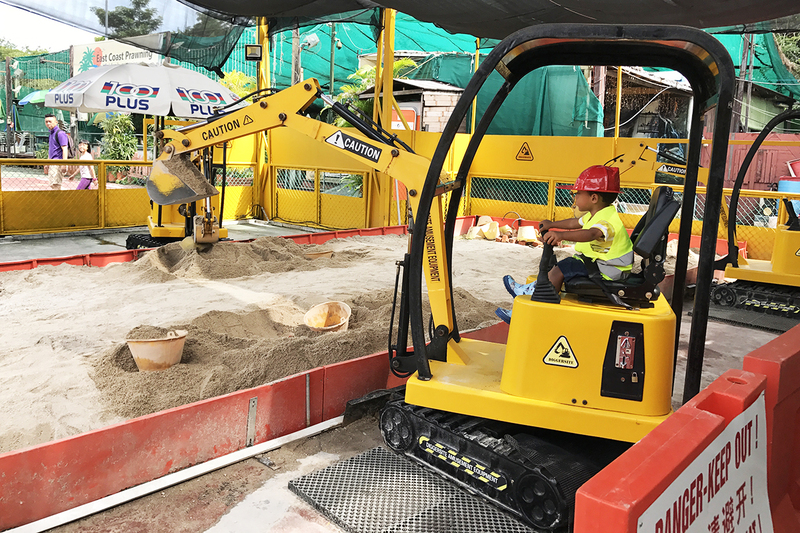 At this small construction themed park, kids can use scaled down diggers to pick up logs, sand and balls while dressing up in a hard hat and reflective safety vest. Tokens for the construction vehicles are purchased for 5 minute rides. Check their Facebook page for their current location. A stroll through the beautiful Chinese gardens will bring you to the Living Turtle Museum. For a small entrance fee, you and your little ones can see free roaming turtles, as well as a large collection in tanks and separate enclosures. Right next door there’s even a koi pond. This kampong style petting zoo in Seletar West is sure to make a fun kids day out. Entry is free and you can support them by buying feed for the animals. See horses, bids, rabbits, guinea pigs and fish all on the grounds. Tour the Hay Dairies goat farm and see the goats being milked and fed. At the end of your tour you can even try some goats milk and purchase a few to take home for later. 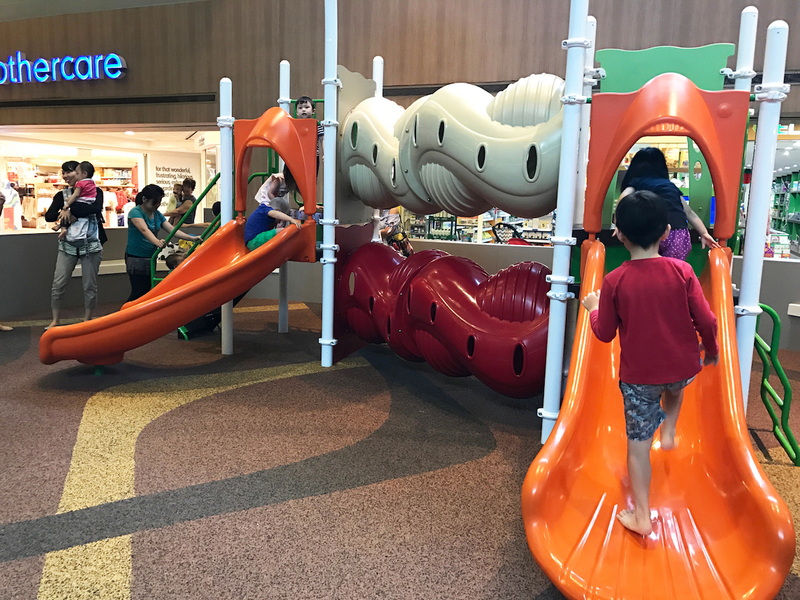 Mall playgrounds are also a great source for free or cheap things to do with kids in Singapore while offering an option that’s usually easy to get to by public transit, sometimes indoors and always has near-by food options. 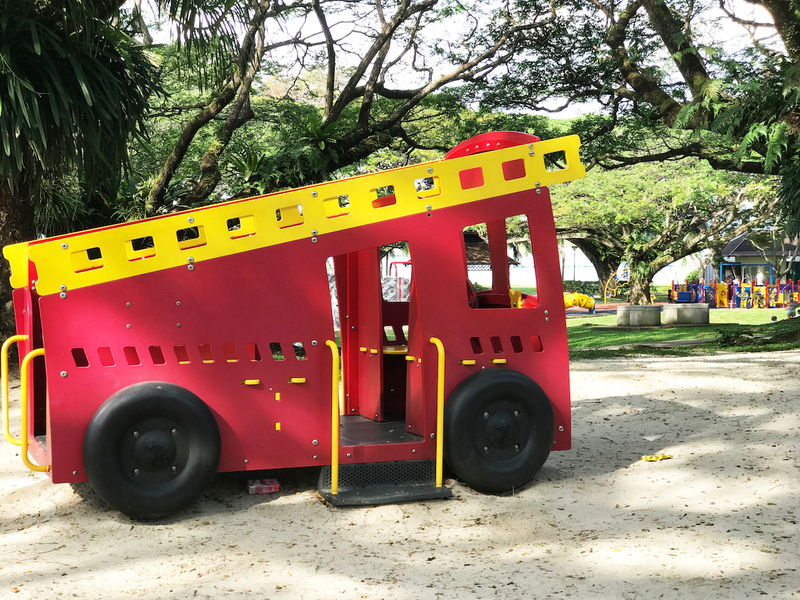 With so many things to do with kids in Singapore, don’t miss the free PIP’s PLAYbox. Located on level 4 of the Esplanade, PIP’s PLAYbox is a free indoor activity space designed specially for kids and families. Kids can find a nook to read or take part in a crafts activity. Also in Jurong, this mall has both a covered playground as well as a waterpark. The flower-themed water play area has tipping buckets, different rain showers and lots of spraying water, while the covered playground will keep kids entertained with slides and lots to climb on. IMM also has 2 extra long tube slides the kids will love. Slides, sculptures and tubes located in the courtyard area of the second floor provide an outdoor playground for kids to run around. When it’s time to cool off, the rooftop wading pools are a lot of fun. 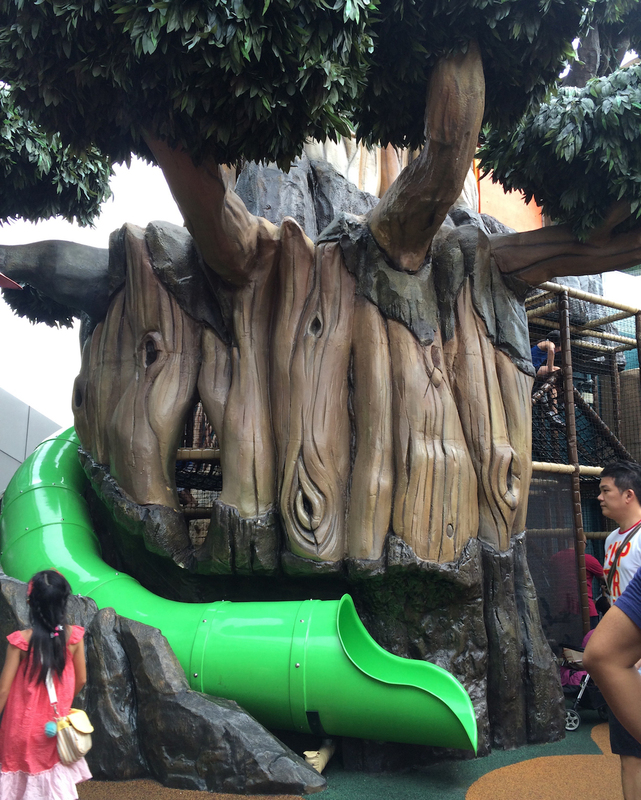 This 11,000 square-foot outdoor fantasy-themed playground located on level 4 of Westgate Mall in Jurong, is Singapore’s largest mall playground. 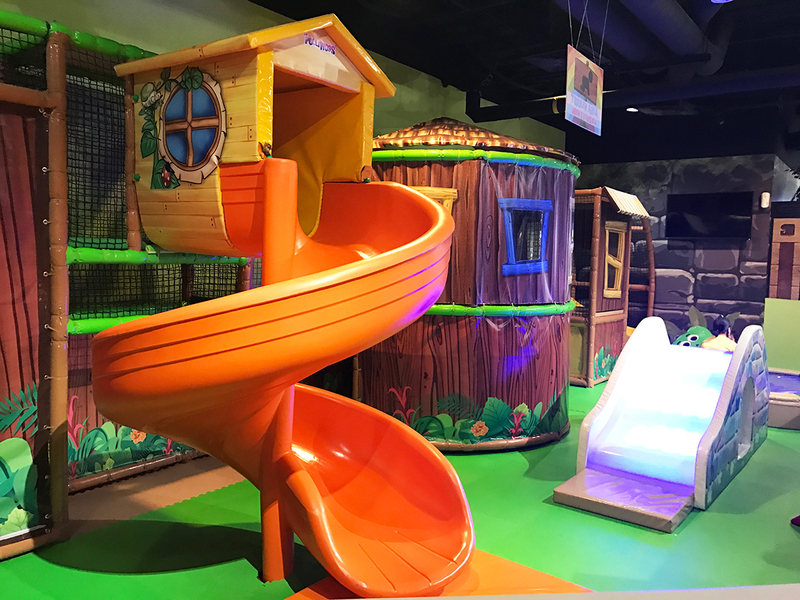 Recommended for children aged from 2 to 12, the playground is larger than life with a 10-meter tall tree house, water zone, a climbing wall and different areas suitable for kids of different ages. Make sure to bring their bathing suits as kids will love splashing around the rooftop waterpark with a variety of rain showers, tipping buckets, and a slide. 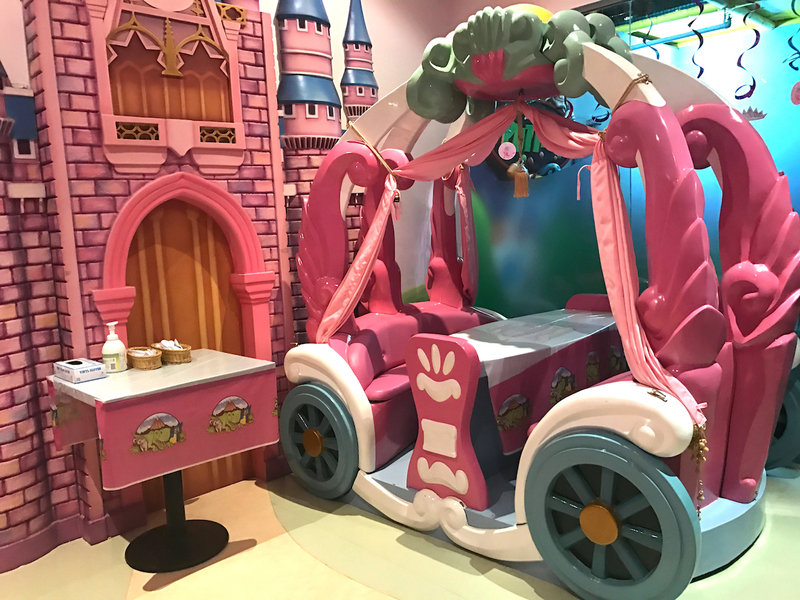 This indoor playground located on level 5 of Paragon mall is a great place for kids to let off some steam while shopping along Orchard Road. Children can find their way through tunnels and down slides in this little space just for kids. 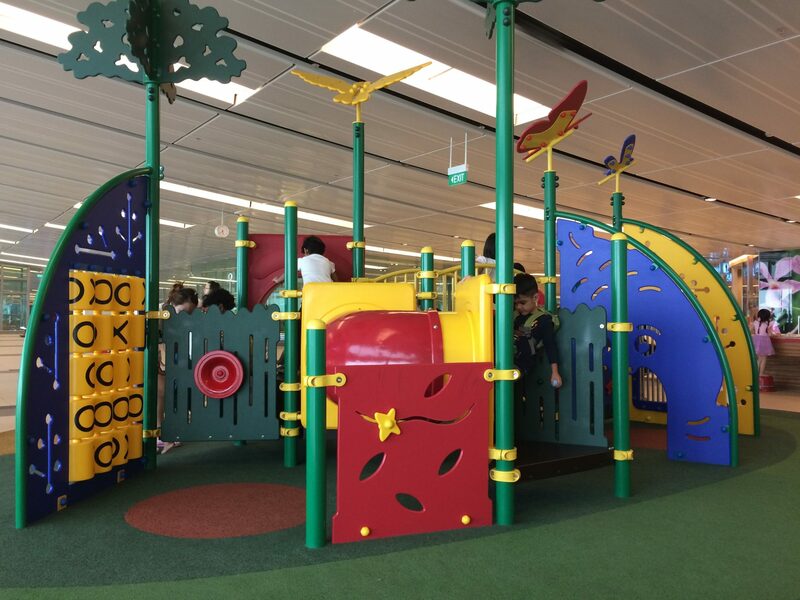 There are a few different playgrounds and play areas at Changi Airport which provides air conditioned fun for the little ones. Highlights include the Canopy Playground at the Viewing Mall of Terminal 1 (Level 3), and 2 multilevel slides at Terminal 3. 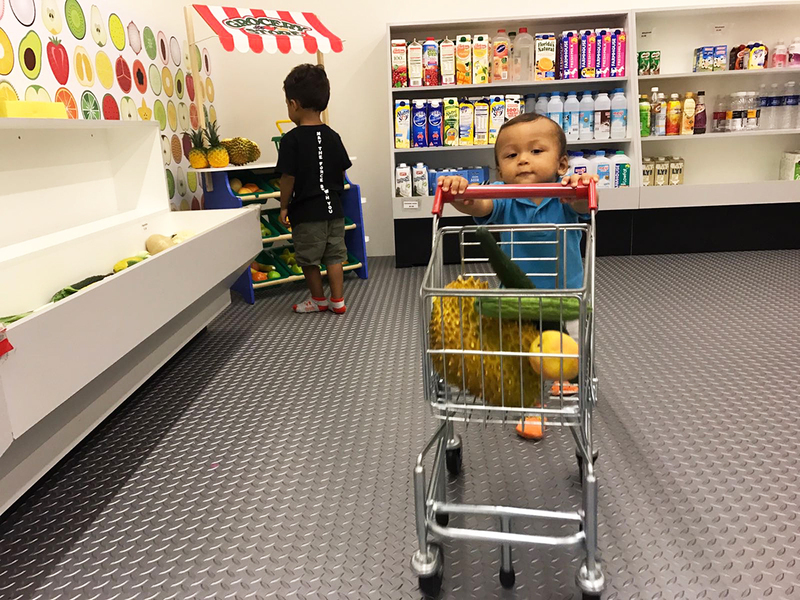 Let the kids play at Ikea’s free indoor playground while you shop or grab a bite at the Ikea restaurant. Complete with a ball pit and lots of structures to jump and play on, it’s sure to keep the kids occupied long enough while you scout out new home decor. This wildlife themed rooftop water playground has lots of areas for kids to splash around in and get thoroughly soaked. When you’ve run out of outdoor things to do with kids in Singapore, head indoors! This 23,000 sq ft indoor water playground will be opening on 24 April 2016 at the new waterfront Safra Punggol. The play area spans three storeys with eight play decks, five slides and party rooms close to the play area for families to host events. KidZania is an interactive kids’ city combining inspiration, fun and learning through realistic role-play for children aged 4 and above. Kids can independently explore an 81,000 square foot kid-sized city, complete with buildings, paved streets, vehicles and a functioning economy. An interactive playground for kids aged 2 to 8 years old that simulates life in a city with small scale versions of a supermarket, clinic, fire station, and post office. Locations in Liang Court on River Valley Road and I12 Mall in Katong. Reopened in April 2016 after a big renovation, eXplorekid @ Downtown East is back and better than ever. The lit ball pool has returned as has the Mega Play area with the multi-level obstacle splay system where children can crawl and climb to explore. Whats new is a dedicated toddler play area with tree slide as well as a sand play area. Mosh is an interactive Digital Multi-Media Theme Park that is the first to bring this futuristic edutainment concept to Singapore. Using advanced, special tools and cutting-edge technology from Japan, they handcraft interactive, digital exhibits to bring your child’s imaginations to life, instantly. 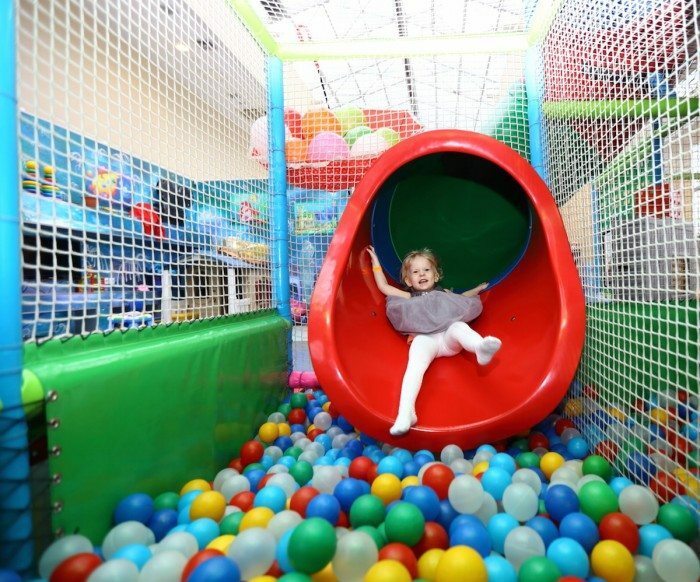 Located in Great World City, Amazonia offers a central indoor playground for kids to play. Inside there’s a separate toddler only area, a large jungle play gym, a Space Ball area a 3D Glow Golf and a bistro to keep active tummies full. This place also has to be one of the coolest party venues in Singapore with elaborate race car and princess themed rooms. Kids of all ages and adults will love Play Nation. Located inside the new Our Tampines Hub, come here to spend hours playing games whether it’s board games or video games. The set up is ideal for groups and families to play together and meals and beverages are available for purchase. Prices are by the hour and vary depending on the day, time, and whether you’ll be playing board of video games. 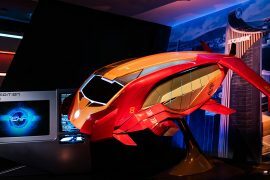 A new permanent exhibition at ArtScience Museum, Future World allows you to explore a fully immersive 1500-square-metre digital universe. Fifteen art installations are brought to life and evolve in real-time through visitor presence and participation. Kids will especially love the ball area where they can play with large colour changing balls as well as the opportunity to see their drawings come to life on the digital display. 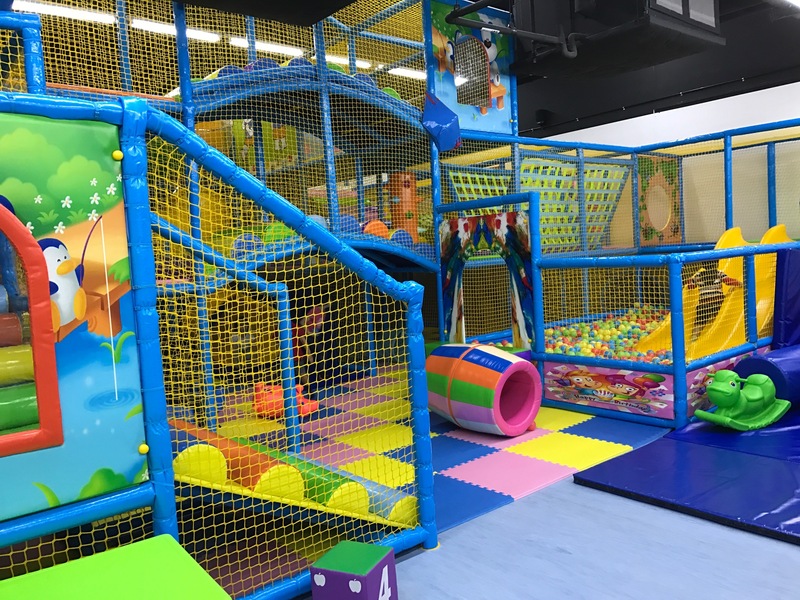 With four different indoor playground locations spread across Singapore at Suntec City, East Coast Park, Robertson Walk and VivoCity, there’s sure to be one of these indoor playgrounds in your neighbourhood. A ‘park’ of nothing but rows of connecting trampolines for kids and adults to bounce on. Sure to help everyone release some energy and burn calories. Check website to see which locations are open. Located in Suntec City, this indoor playground is a lot of fun for kids of all ages. Infants to toddlers can enjoy their own little area just for them while bigger kids can slide down slides, play with Leggo, do crafts, play dress up and lots more while adults can enjoy a meal and a drink. The BearyFun Gym at UE BizHub East in Changi is a fun and affordable trampoline park and indoor playground. While it’s designed for kids 2 and over so that kids under 2 get in for free when accompanying an older sibling, it’s fun for the the whole family and when I say whole family, I mean it. Adults and kids will love running and jumping on the trampolines while babies and toddlers can play in the ball pit and climb on different structure. Bonus tip: head to the teddy bear restaurant ‘I’m Here ‘ (see below) around the corner where the kids can dine with human sized bears. An ‘edutainment’ centre in Singapore that aims to engage kids from 18 months to 8 years old in themed play. The different zones include a construction themed play area, a Dino Sand pit, a supermarket and a flight & space themed zone. It’s a cross between an indoor playground and fantasy-land. Fidgets is a series of indoor playgrounds in Singapore with 3 different locations around the island at The Grandstand, Marina Bay Sands and Paragon Shopping Centre. Each location varies in size with Fidgets World @ Grandstand being its largest flagship location at over 16,000 sq.ft. Check the different locations to see which activities are offered including baking, music arts,crafts and make-overs. The basement of I12 now has a sand play area (made with cassia seed) with the opening of PlayCots. The indoor playground also has art activity areas. 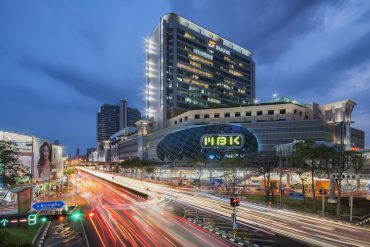 Lucky for us, there are lots of restaurants that have things to do with kids in Singapore which may include a pool, a nearby playground, or an in restaurant play area. Here are our favourite restaurants with places for the kids to play while the adults eat. Hang out with the horses at this café overlooking a field of horses. See them being groomed and exercised with a great view from the balcony. Look out for pony rides and leave time to play in the adjoining playground. Enjoy home-made European specialties and various refined foods – prepared right before your eyes at several market stalls. 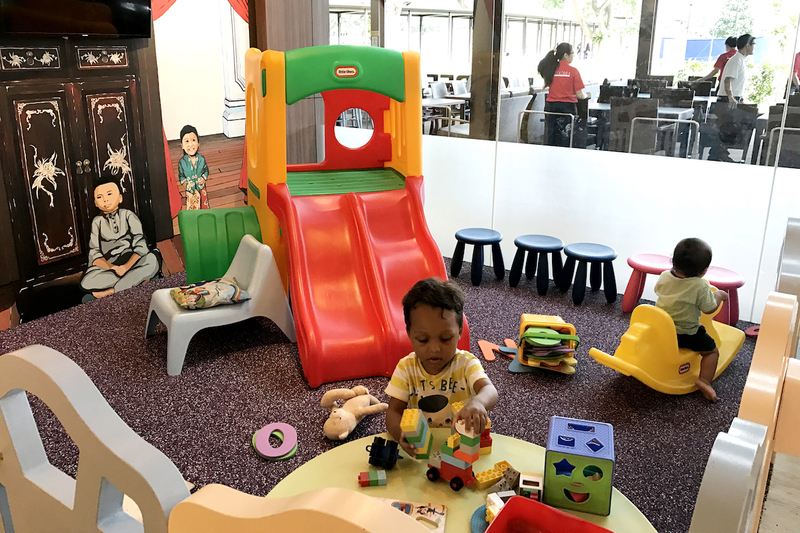 Both Marché [email protected] and Marché Mövenpick Suntec City have indoor play areas for the little guys, while the newest location at Suntec has the larger play area. This East Coast Road restaurant not only serves up great Indian food, it also has a little corner for the kiddies to play that has a variety of toys and a little play house. Located in Punggol, Whisk and Paddle offers and all-day breakfast menu as well as a great selection of western fare. The large outdoor area offers views over the neighbouring cycle path and park while the indoor air-conditioned park offers relief from the heat. Families with little kids will enjoy the large play area with a padded mat, a small selection of toys and a couple mini seesaws. Perfect for kids 0 to 4 years old. Enjoy Peranakan cuisine in a kid friendly environment in a prime location next to Marine Cove Playground. When the kids need a meal and a break from the popular Marine Cove Playground, head indoors to Babalicious. Here the fun doesn’t have to stop as the kids can play at the indoor and air-conditioned play area perfect for toddlers while waiting for the food to come. To make your meal selection easy, choose from one of their set meals for 2 or more from the computer found at each table. Fresh, healthy food is the focus here along with great coffee. The Pantry’s menu is a fusion of Mediterranean and Asian cuisines. With a children’s menu, an outside trampoline and play set, The Pantry is an ideal cafe sure to be fun for the whole family! For the parents that miss having a relaxing coffee out. One Thing Coffee serves up coffee, smoothies, waffles and lots of other goodies at reasonable prices. Best of all, the large play area is great for toddlers with a ball pit, ride on cars, play kitchen and lots of toys. Located in the basement Bukit Timah Shopping Centre. Charges apply for the play area. Happening every Saturday starting in May 2015, the Saturday Social BBQ promises to be an afternoon of fun for the whole family. Each Saturday brings different surprises but always expect lots of fun for kids with activities, crafts and games. From 4pm onwards. Check Timbre for the latest updates. Set in East Coast’s family friendly area of Parkland Green, this restaurant serves up great drinks and a western menu of pizzas, pastas, mains and much more. The bonus for this restaurant is the pool out front for kids to splash around in. If the pool isn’t enough, bring along their scooters to play along with the throngs of other kids scooting around this area. Another spot in Parkland Green, this place has a little slide and rocking toys to keep toddlers entertained. A great spot for an afternoon ‘pick me up’ of waffles, ice cream and of course coffee. It’s also located right next to a large grass field so bring the soccer ball too! George’s at East Coast Park has a sand play area with mini slides, lots of sand toys and a little picnic bench for the kids. 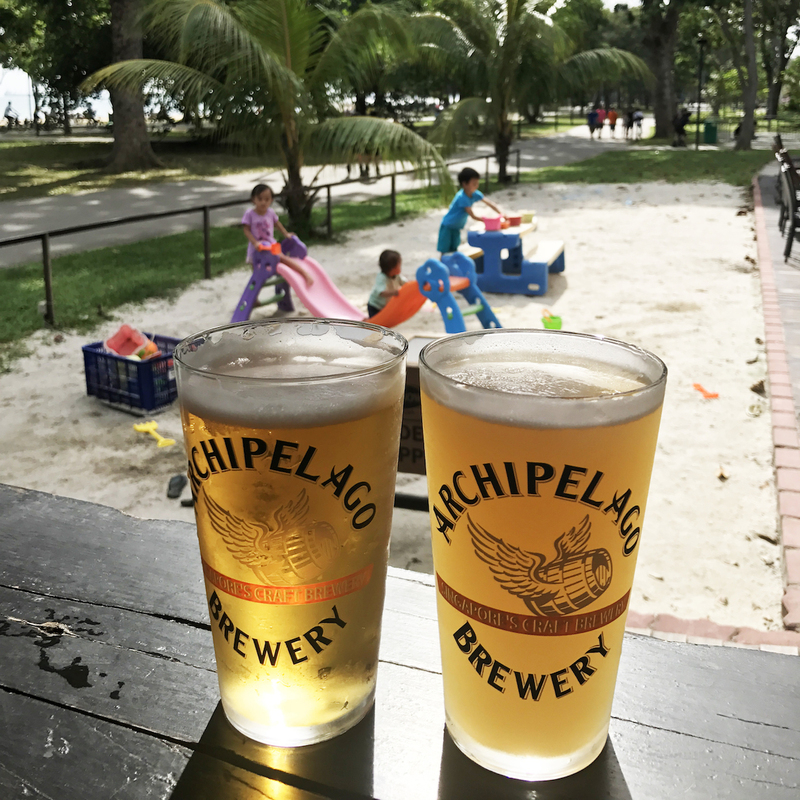 Young kids can play in the sand while their parents can sit happily close by with a pint in hand or while enjoying a juicy burger. Coyote at Phoenix Park, Spruce’s sister location, serves up Tex Mex cuisine in a laid back atmosphere. While the restaurant is upstairs, kids can play in the playground just downstairs which often has a bouncy castle on the weekends. Serving all-day-breakfast, burgers, salads and mains, this restaurant is great for the whole family. Little ones can play at the outdoor playground perfect for toddlers, while adults can keep an eye on them through the full glass walls. When looking for things to do with kids in Singapore, not everyone thinks of Sunday brunch, but a good Sunday brunch can offer not only lots of activities for the kids but also a chance for parents to dine in peace. Here are our favourite kid friendly Sunday Brunches in Singapore. This Italian restaurant earns extra points for being super family friendly on Sunday where they open up their kiddie playroom just for their weekly Sunday brunch. The kids can bounce away on a bouncy castle and take part in crafts and activities while adults can enjoy a buffet spread of Italian fare. This is a Sunday brunch both parents and kids will love. While parents can choose between a premium, standard or alcohol free champagne brunch, kids can enjoy fun activities from 12:30 pm until 2.30 pm. The activities include creative fun such as sand art, Play Doh, face painting and balloon sculpting. Enjoy a luxurious Sunday brunch at breath taking heights with an array of seafood, roasts and desserts, accompanied with live entertainment and activities such as a magic show and balloon sculpting. On the last Sunday of every month during their ‘Pink Brunch’ Pink Panther also makes a special appearance. The interactive “Food Theatre” allows you to see the food being prepared before you. Satay grilling over charcoal, tempura being scooped from the oil and pizzas being pulled from the oven. Kids will not only enjoy the chocolate fountains and dessert area, but also the dedicated kids corner where they can watch kids shows on tv. 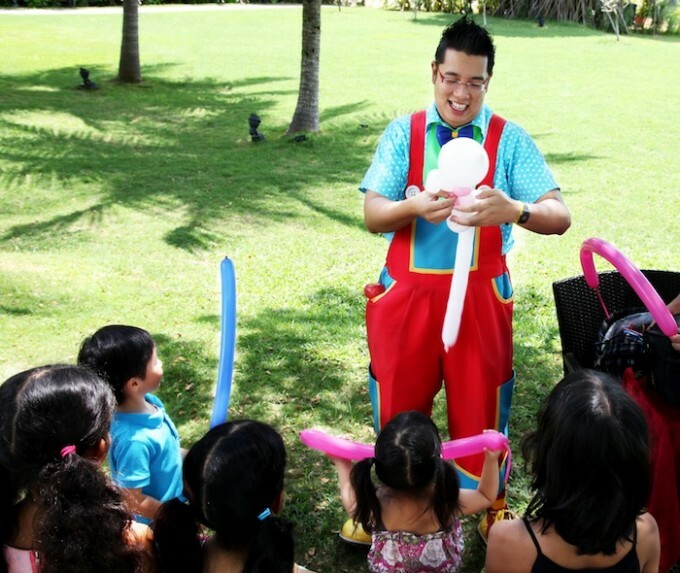 On Sundays, Da Paola brings out fun activities for the little ones including a variety of crafts and balloon sculpting. Their Sunday brunch menu features pasta dishes, a variety of mains like a great burger, fish, meat, some eggs and pizza too. Every Saturday and Sunday, enjoy a Tuscan style brunch at La Barca when they open up their kids playroom for guests from 11am to 3pm. The playroom includes toys, tables for colouring and a small slide. While kids play, parents can choose from a menu of pizza, pasta, brunch regulars and even top up their meal by $45 to enjoy free-flow Prosecco from 11am to 2:30pm. Stop by for brunch every weekend from 8:30am to 4pm and enjoy an all-day breakfast menu while kids enjoy playing in the huge lawn in front or on the bouncy castle. 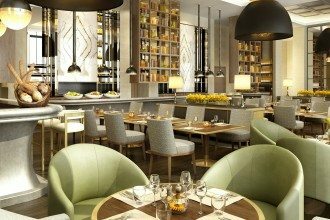 Café Mosaic at Carlton Hotel has created a lunch buffet with families in mind. The Weekend Lunch Buffet available every Saturday and Sunday from 12pm to 3pm includes family friendly food selections as well as activities for the kids. From 12-2pm the kids can decorate cupcakes, and be entertained with activities such as storytelling and collecting balloon creations . 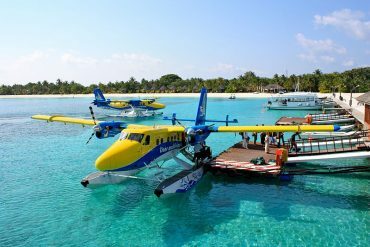 For a small island, there are lots of things to do with kids in Singapore including aquariums, zoo and amusement parks. Here are a few kid friendly activities not to miss. Every Saturday morning from 9 to 11am, visit your local fire station for their open house where they’ll show you around the station and share their roles. Little fire truck loving buys are sure to have a great time. Ride the movies at Universal Studios Singapore where you can experience rides, shows, and attractions based on your favourite blockbuster films and television series, including TRANSFORMERS The Ride: The Ultimate 3D Battle, Shrek 4-D Adventure, Madagascar: A Crate Adventure, Jurassic Park Rapids Adventure, and now Puss in Boots. The SEA Aquarium is home to more than 100,000 marine animals from over 800 species. 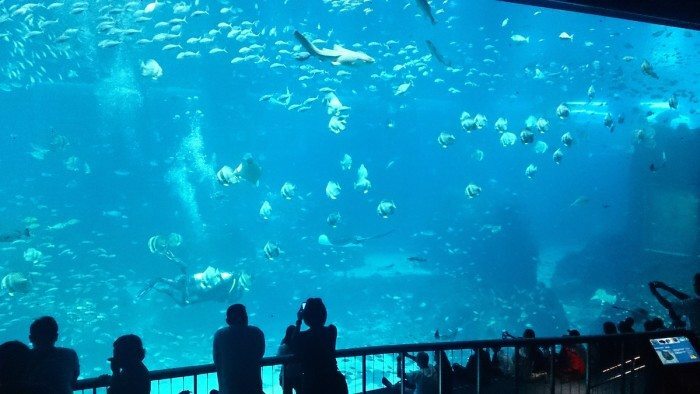 Walk through tunnels with hammer head sharks swimming above and relax at the viewing area with a floor to ceiling aquarium full of manta rays and other marine life. 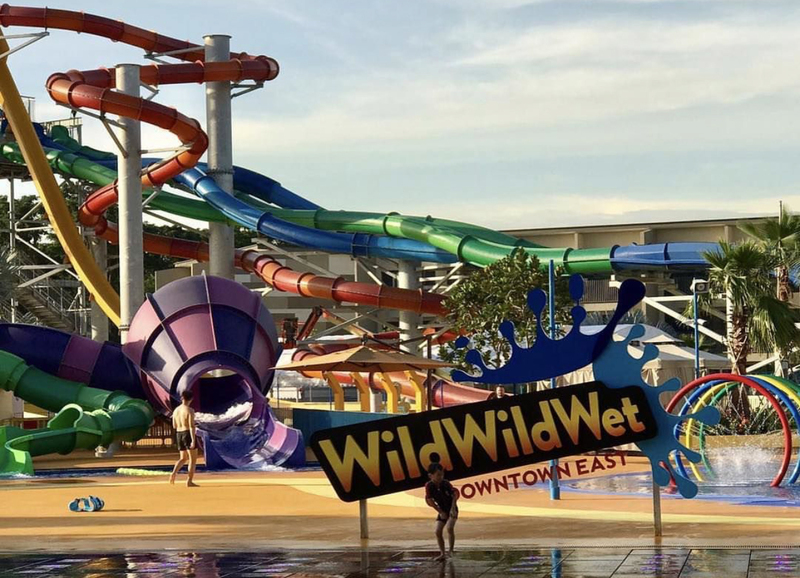 Zoom down thrilling waterslides, chill out at Bluwater Bay wave pool, or grab a tube and journey down the Adventure River. The interactive exhibits cover a wide range of topics related to science, technology and mathematics. There is an additional 20,000m2 of outdoor exhibition space showcasing the Waterworks exhibition, Kinetic Garden and Ecogarden. Asia’s largest bird park with a collection of more than 5,000 birds across 400 species. Look out for feeding sessions and shows to get up close with exotic birds. Their bird-themed playground has both wet and dry playzones for families with kids of all ages. 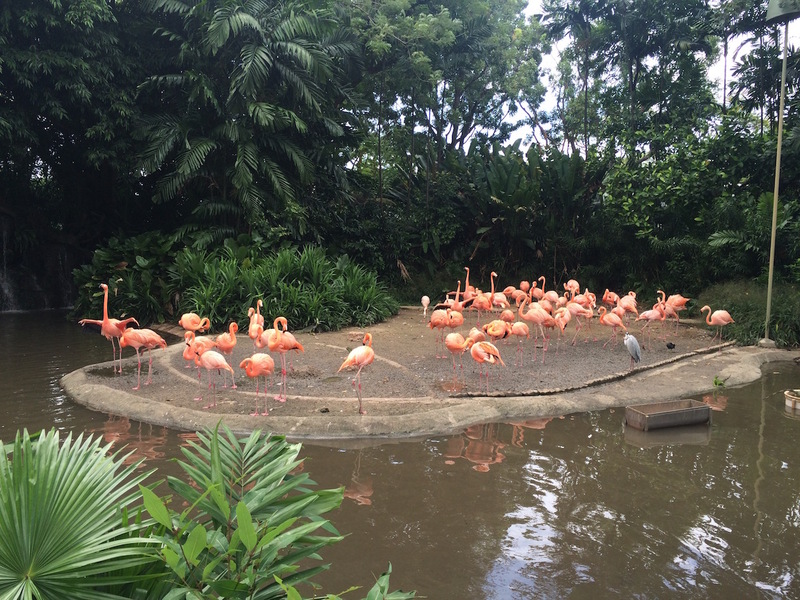 A wildlife park setting where animals roam freely in open and naturalistic habitats. Arrive early for the Jungle Breakfast with Wildlife where you can enjoy the company of orang utans. The Zoo’s playground has a wet play area and pony rides. The world’s first safari park for nocturnal animals, the Night Safari has to be one of the most well known attractions to visitors to Singapore. The guided tram ride takes you across 7 geographical zones of the world, with an option to explore the walking trails in 2 giant aviaries. Look out for the nightly performances with fiery stunts. Housing one of the world’s largest collections of freshwater fauna, the park features over 6,000 animals including 40 threatened species. Take a leisurely stroll through the park or hop on the River Quest boat ride. This water park has some seriously fun rides. Filled with slides and rides, the family can rent and ride on inflatable floats and have a thrill of a lifetime. Located in Downtown East in Pasir Ris, the newly renovated park even has a splash pad area for little tots. A chance to experience snow without leaving the tropics, Snow City houses a 60-metres long snow slope (think bunny hill) for visitors to snow tube down as well a multiple mini snow slides the younger kids will love. Entry includes boots and a jacket but gloves are recommended if you’re going to play in the snow. At -10 degrees, little hands and toes get cold fast so dress in all of the cold weather clothes you own. Note the management won’t let you take photos of your kids inside the snow chamber, instead they have professional photographers ready to take your pic and sell you the prints. Who says Singapore doesn’t have any waves? Well maybe no natural ones, but at Wave House Sentosa you can ride an endless barreling wave, or carve up and down a non-curling wave for beginners. 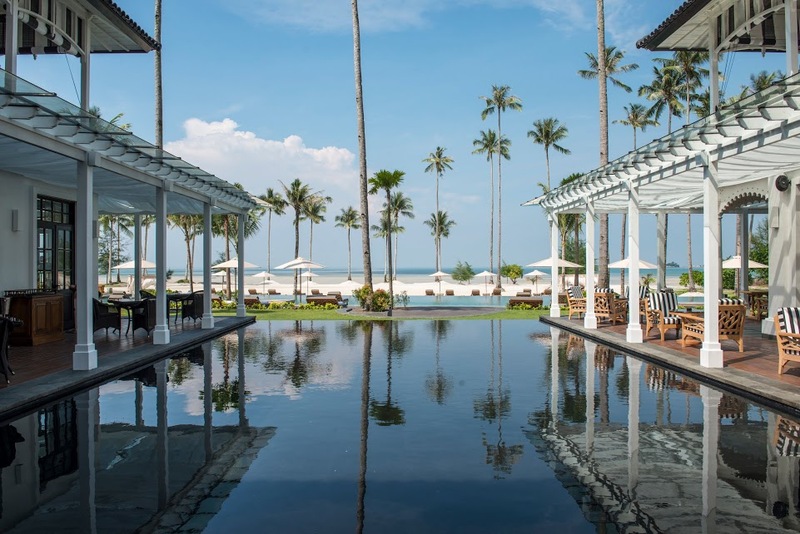 With it’s own plunge pool, restaurant and bar, there’s fun for the whole family. This farmers market is only offered quarterly, but is worth the wait with over 50 stalls, live music, an animal corner, and fun workshops. It’s a chance to buy artisanal products and produce direct from farmers. The world’s first green library for children, My Tree House is a kid themed area of Singapore’s Central Public Library. Made with eco-friendly building materials, the centrepiece in the library treehouse is the canopy made from more than 3,000 recycled plastic bottles collected from the public. A fun atmosphere to spend an afternoon reading books. ‘Play at National Museum of Singapore’ is a year round kid friendly area of the museum set up to entice the young ones. Look out for rotating activities as well. Previous articleAirbnb or Hotel: Which is Better?